I woke up really early on the Tuesday morning, at 05h00, after getting in after midnight the night before from San Diego. I'd stayed at Mike's townhouse that night, and he was giving me a lift into Seattle to my hotel. 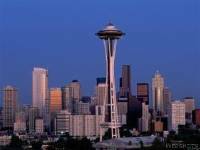 I stayed for 2 nights at the Mediterranean Inn about 2 blocks from the Space Needle. It is no understatement when you hear that on every street corner there is a Starbucks coffee shop!!! Even in the foyer of my hotel there was a Starbucks, so I ordered a Tall Capuccino with extra foam to go, and headed up to my room to get a quick 40 winks ~ bearing in mind it was about 06h30 in the morning, and nothing opens til 09h00, so I had time to kill!!! Mike had suggested a couple of things I should do: The Ride the Ducks Tour www.ridetheducks.com; Bill Speidel's Underground tour www.undergroundtour.com and Pike Place Market; I went online and saw that there was a Ride the Ducks Tour at 1pm and the departure point was at the foot of the Space Needle, so I booked a ticket online and headed out!!! The tour was very well done by a big burley American, who loved to entertain his passengers!!! We all loaded into Amphibious World War II vehicles from which you can see Seattle from both land and water!!! We headed to downtown Seattle, Pike Place Market, historic Pioneer Square, Funky Fremont, then, splashed into Lake Union for a spectacular view of the city skyline, luxurious yachts, and Sleepless in Seattle Houseboats! What a great way to see the city, and I got a great overview and made a note of the places I wanted to explore further!!! So, the observation deck is 520 feet above the city, and the views are incredible!!! Take a look at some of my photos from my Seattle Album. After lunch, I decided I needed to walk off a couple of calories, so took a walk around town!!! Across the road from the Space Needle is the building where Grey's Anatomy is filmed ~ and it isn't even a hospital building!!! It's just a fancy office building ~ The show isn't actually filmed in Seattle, but every once in a while, the film crew come to Seattle to film a couple of location shots - the rest is done in a studio!!! From there I headed down towards the Ferry Terminal (where the awful Ferry crash episode was filmed from Grey's Anatomy) .... wish I could go back now and watch that episode again, and see if I recognise any of the scenes !! There are loads of wonderful seafood restuarants along the Fishermans Wharf, and I made a note to come back the next day for lunch!! I walked most of the way back to my hotel, and then hopped on a bus for the last haul up the hill!!! Had an early night, as I was pretty tired from the late night and early start ~ the hotel had a laundry room, so I put on a load of washing, which was handy!!! I went online again, and made a note of where to do the famous underground tour the next morning, and had an early night!! !